I don't know about you, but I feel like I am hearing of more bullying situations as the days go on. I am hearing about how far things go with bullying/cyberbullying and what effect this is having on our children and it is starting with children at such young ages. I am so saddened by this because in some cases, it is even resulting in lives lost and I can't imagine how we have let things go so far. I want to make sure that I am doing my part to teach AB to not take part in hurtful behavior but I also want to make sure that I help AB to understand her worth, so that in the event someone starts bullying her (which I hope and pray never happens, obviously) she will not let it effect her so greatly. So I decided to create a project that will have a daily reminder to AB about herself. I hope that by starting this behavior of self worth now, I can somehow avoid anyone's mean behavior affecting her so greatly. Now, my goal is not just to help her in coping with any possible bullying toward her in the future, I also hope that she will have the confidence to help others if they are being bullied. So I completed this project as a daily affirmation for AB. All of the products used, except for the velcro, were found at the dollar store so this project was extremely cheap, $6 to be exact! On one strip, I wrote "I am" and on the other strips I wrote adjectives. On the adjective strips I applied the loop portion of the velcro and on the poster board, I applied a hook piece. This way, they can be attached and detached easily. 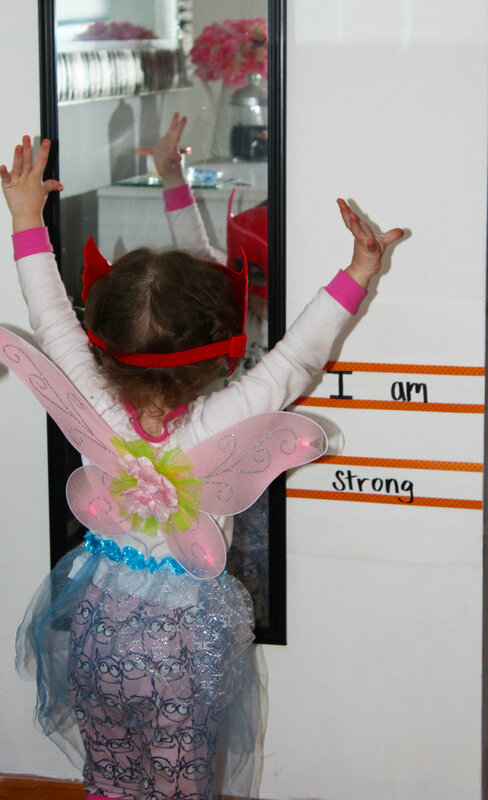 I have placed it by a mirror in our house because I think it is important for her to say it while looking at herself. Everyday, AB picks a strip and attaches it to the velcro on the poster board. She then say sit aloud to herself. The particular day in the photo below, AB decided she wanted to be a fairy princess super hero and I couldn't think of a better photo opportunity! I know some of these words are big and she may not fully understand what she is saying but, in addition to this exercise helping her to identify words, I think, more importantly, it will start her on a road to self love. I am going to be honest, I don't know if this will work. I don't know if this is going to make any kind of difference, but I feel like I need to do something. AB is going to be going to school soon and I am terrified about what will take place for her when she goes. When she gets around other children now, she is very timid. She plays with them and engages but she is very quiet. If a kid takes a toy or pushes her, she just stands there looking shocked and not knowing how to react. She doesn't say anything, but she stands with a defeated look on her face and I am terrified about what might happen when she goes to school since I can't be there to see these things happen or to tell her she's ok. I can't protect her from everything because, I have to let her experience life and that is scary because life can be hard and peers can be mean. I'll tell you, being a parent is not for sissies..most of the time I feel totally clueless. I have no idea if the decisions I am making will impact AB in a positive way but I know that I can't NOT try. I hope that with exercises like these, giving her tons of love and showing her that being kind is necessary and being a leader is admirable, that I can somehow prevent her from taking part in bullying or from letting bullies affect her or those around her. Do you have any exercises or things you do to build your child's self esteem? Leave them below! I would love to hear about it! Thanks for taking the time to visit the blog today.